Peru is the host the 2015 World Bank-International Monetary Fund (IMF) Annual Meetings, taking place in Latin America for the first time in over 40 years. The two Bretton Woods institutions, criticized for their record of lowering social and environmental conditions, seek to showcase Peru as a “success” of their neoliberal policies and reforms to the rest of the world. In the 1990s, Peru embraced the Bank’s Structural Adjustment Program, with the aim to make the country more attractive to foreign businesses through a number of deregulation and privatization reforms, such as the lifting of restrictions on foreign land ownership. Between 1990 and 2015, the World Bank’s loans to Peru increased tremendously, channeling over $7 billion to the country during the period. 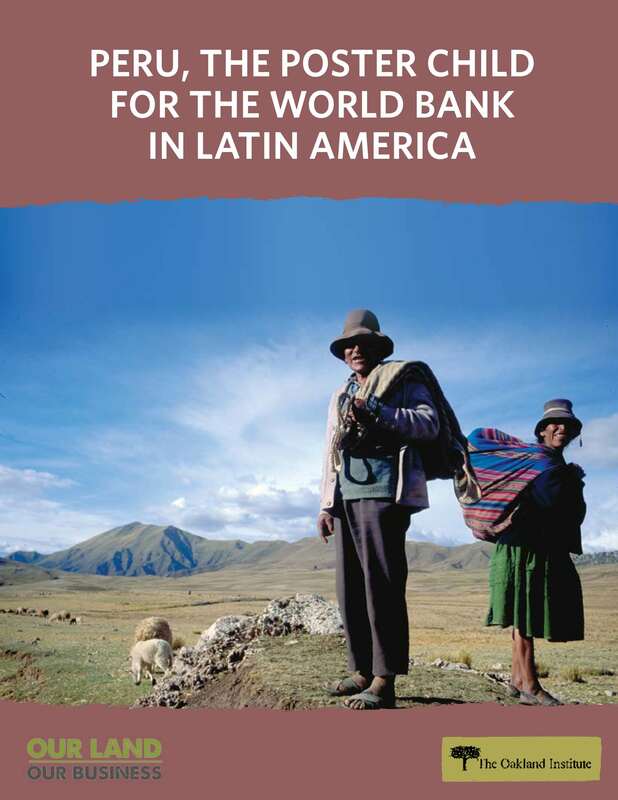 Peru has remained in the good grace of the World Bank. In 2015, it ranks 35th in the Bank’s Doing Business survey, with the second highest score in Latin America, indicating that the government has “created a regulatory environment conducive to business.” In 2008, Peru requested help from the Bank’s International Finance Corporation (IFC) advisory services for the design of a new reform agenda launched in 2009. As a result, the World Bank’s Doing Business survey recorded 15 pro-business policy reforms ratified between 2010 and 2013, including fast-track procedures at the land registry, cuts in workers’ social benefits, and tax reductions for private companies. Following the reforms, Foreign Direct Investment (FDI) doubled from $5.5 billion in 2007 to $10.2 billion in 2013. However, improving Peru’s business climate to attract foreign investment has had a severe toll on people, workers, and the environment, resulting in rising social conflicts.9 Simultaneously, Peru’s export-oriented economy has experienced a significant slow-down over the past three years, notably due to China’s lower demand for oil and minerals. The drop in the economy’s growth rate from an average of 6.4 percent in the 2000s to only 2.4 percent in 2014 raises important questions about the high social and environmental costs associated with the country’s “development” path.